Against overpowering hardships, thousands of Burundian children strive for a better future each day by walking more than 12 miles to school. 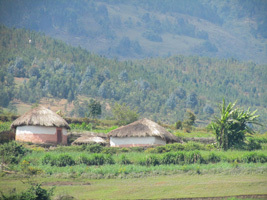 Burundi has been called the “Switzerland of Africa” because of her hilly and mountainous terrain. Besides the beautiful landscape, Burundi is known for year-round spring-like weather, creating ideal conditions for subsistence farming. The country’s main exports are tea and coffee. In 2013, a group of Burundi Education Fund Inc. board members and their families participated in a once-in-a-lifetime Mission Trip to Burundi that altered their views, compelling them to serve as devoted advocates for the children of Burundi. 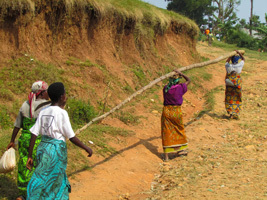 Burundi, one of the poorest countries in the world, is nestled between Tanzania, DRC (Congo), & Rwanda. Rwanda & Burundi share the same colonial history. Both have endured the same ethnic cleansing and genocide events that have occurred since the 1960’s. Since the end of the most-recent 13-year civil war (1993-2006), the Burundi recovery has been extremely slow and the poverty level has deepened. Its per capita GDP has been even lower than that of Haiti since 2010. Education has become a costly privilege in Burundi; very few students graduate from high school. Electricity, clean drinking water, sanitation and other basic infrastructure are absent from the majority of schools. Burundi has the second highest population density in Africa with an estimated 9 million people in only 10,740 square miles (similar to the size of the state of Massachusetts). According the Central Intelligence Agency, Burundi has the 7th highest birthrate in the world. Due to the harsh living conditions, including disease and food deprivation, Burundian life expectancy is less than 62 years. Against overpowering hardships, thousands of Burundian children strive for a better future each day by walking more than 12 miles to school on rough country paths. And often without shoes. These children are resilient to the unfortunate forces surrounding their lives and know that their only ticket out of poverty is education. Just a small act of kindness, a donation, can make a difference between certain poverty and the possibility for something better. Please give these students a fighting chance to become something or someone greater than their circumstances.